Swirl marks are scratches in the finish. Sometimes these scratches are microscopic in size and only visible in bright light, like direct sunlight or very intense artificial lights. 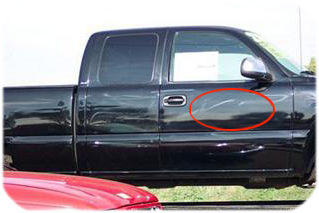 Other swirl marks are very deep and are easily visible in just about any lighting condition. Swirl marks can generally be placed in two categories, which describes the origin of the swirls. also called spider web scratches, car wash scratches, towel scratches etc.Cobweb-effect is the term used to describe the visual appearance of the thousands, and even hundreds of thousands of tiny scratches inflicted into your car's finish through normal, everyday wear and tear. Working from the bottom up potentially dragging dirt that has accumulated on the bottom parts of the car to the cleaner upper section of the car. Using tatty, worn, dirty, or scratchy wash mitts, sponges, drying towels etc. It doesn't take much to inflict a scratch in today's modern clear coat finishes; every chance you have to prevent inflicting scratches should be utilized. Automatic car washes. Many automatic car washes still rely on spinning nylon bristle brushes to scrub your car clean. While these brushes may clean really well, they also instill many unnecessary scratches. Remember this also: any automatic car wash system that relies on some type of material that comes into direct contact with your car's finish has the potential to instill scratches. You see it doesn't matter how soft, or state of the art their system is, if the car or truck before you was 4-wheel drive dirty, the dirt removed from their finish can potentially still be in the system (imbedded in the brushes or threads) whereupon it can be rubbed across your car's finish. Automatic car washes are usually not recommended if you want to keep your finish scratch-free. Hand Car Washes. Hand car washes while generally speaking are much safer as far as quality goes, you still have to ensure that the employees are doing quality work and have been trained how to best wash a car without instilling scratches. As a standard rule, anytime a wash mitt is dropped to the ground, it should not be returned to use but instead should be either discarded or cleaned. One bucket filled with shampoo and water and the other one with plain water and a grit guard. Dip the mitt or sponge in shampooed water and gently rub it on the surface of your car. And after a couple of passes, rinse it in the second bucket to get rid of all the dirt and grime that can harm your cars paint. Finally, Rinse your car with a hose and gently dry with a high quality micro fiber towel. 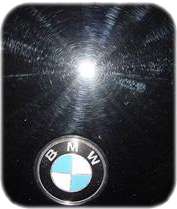 A team of highly skilled detailers will be at your doorstep to removes scratches and swirl marks from your car, leaving behind a rich, deep, mirror like finish.